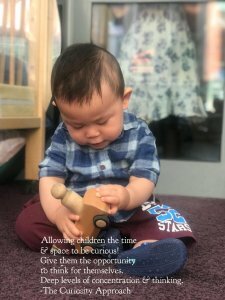 The Curiosity Approach - Curious babies – Let’s reflect. July 5, 2018 Curious babies – Let’s reflect. Are you constantly trying to provide a wealth of activities to ‘PROVE’ you are meeting all areas of their development! Look at our innately CURIOUS infant, fascinated and intensely engaged in the simplest of objects. Babies need time & space to explore to be curious, to discover their world around them. To pause & ponder & feel deeply secure within their surroundings. To investigate at their own pace without the top down prescribed activities thrust upon them. Our babies require mindful practitioners to understand the brain development of our most precious infants. To see that To THEM, the world is new & exciting & it’s ENOUGH! To provide an environment of love. It’s OK we’ve all probably done it at some stage in our careers. Those top-down activities. However, today is a new day today to reflect, Think & discuss. The Curiosity Approach offers Educators inspiration and thought-provoking ideas, to help practitioners reflect on current practice. Helping to ensure we educate our children through heart, hands and head. This blog is subject to copyright protection. Do aprons stop a child’s learning?